This picture tells the story of a neighbor's Kentucky Coffee Tree laid low by English Ivy's long embrace. The smaller trunks are the ivy, which had climbed far up into the canopy of the tree. During the freak snowstorm earlier this fall, the snow clung to all that extra surface area created by the ivy, the extra weight of which toppled the tree. The fallen tree blocked the street for a week. and creeping over, under and through the fence to the south. If a neighbor's runoff is flowing into my yard, I can change the contour of the ground to direct it away from the house, and consider the problem largely solved. But the flow of ivy in from neighbor's yards cannot be diverted, and instead creates a perennial chore. The moral of this story? Never plant english ivy anywhere that its potential to spread is not blocked on all sides by lawn, pavement or foundation. Cut english ivy off of any tree you wish to live. Better yet, never plant english ivy, and remove as much as you can from your yard. One approach to getting rid of it without working too terribly hard can be found at http://princetonnaturenotes.blogspot.com/2007/11/ivy-control-part-2.html. Other related posts can be found by typing the words english ivy in the search box at the upper left corner of this blog. If I were organized enough to keep faithful track of when migratory birds pass through, I would write neatly and clearly in that hypothetical journal that on Friday, Nov. 25th, some exact number of robins, let's say 15, visited the backyard, accompanied by a few white-throated sparrows, juncos and chicadees. The robins busied themselves flipping over red oak leaves in search of delectable insects or worms hiding underneath. A robin's orange breast starts making complete sense as camouflage once you see it amongst the similarly colored leaves, as if one were the reflection of the other. When I lived in the piedmont of North Carolina, there would be one day in the fall when hundreds of robins would descend upon the neighborhood and strip the dogwoods of their ripe, red berries. If we were lucky, we saw a green female scarlet tanager mixed in. I've often wondered how these migrations are fairing since an introduced disease greatly reduced the numbers of flowering dogwoods in the eastern forests, and whether the timing of berry ripening and the birds' arrival is being thrown off by climate change. Nature has adjusted to very gradual changes in the past, but the multiple changes--new species, new temperature regimes--we're throwing at it are by comparison very rapid. One of this blog's "pages" (listed in the right column as Leaves) contains my annual letter to the editor calling for clean streets and backyard composting, and each year the dumping of leaves, dirt, grassclippings, branches and garden trimmings on the pavement becomes more emphatic and non-stop. The power of the pen is overrated. What does a tidy yard gain the homeowner if the street in front of it is clogged with debris? It's as if we've disowned the public space. Dumping on the streets has become a year-round, essentially unregulated activity. True, the leaves, etc. eventually end up getting composted outside of town, but collecting leaves is a highly mechanized, gas-gulping process that makes municipal workers unavailable for other tasks. And leaves the streets strewn with organic debris that then adds a nutrient load to local waterways. Streets function essentially as ephemeral creeks, connected directly to local streams, so that the dumping of organic matter in the streets is akin to dumping directly into a waterway--an urge society was supposed to have cured itself of decades ago. There was a time when leaves were appreciated, not only for their rich fertilizer value but for their beauty and the joy a pile of dry, crisp leaves can bring to kids. Many homeowners have abundant space in back, yet make a point of raking all leaves to the street. Seeking to comprehend, I came up with two new possible reasons this year: 1) the frenetic pace of life has caused people to reject the relatively slow pace of decomposition, and 2) since homeowners often take their cues from neighbors, the highly visible practice of dumping leaves on the streets is more readily imitated than the comparatively hidden practice of piling leaves in a corner of the backyard. Last year on Thanksgiving, the New York Times had an oped piece on the surprising role eels played in early Thanksgivings, and in American diets in general. This year, there's a wide-ranging piece on chestnuts, which among other things explains why my store-bought chestnuts didn't keep well in the cupboard. Lacking the fat content that helps preserve nuts like walnuts and peanuts, chestnuts need to be kept refrigerated, the article says. Cooking them after they had sat for a week in the kitchen cupboard, I found that the leathery inner skin had become inseparable from the meat. Water interacts in interesting ways with a backyard kale leaf. Here's frost one recent morning, like a miniature game of pick-up sticks. Put a curly kale leaf underwater, and it develops glittery metalic highlights, much like a jewelweed leaf. The waxy underside of curly kale gathers water into droplets. In the same genre, an oak leaf fringed by frost, reminiscent somehow of a deer antler. The Delaware & Raritan Canal Watch will hold a free walking tour of the D and R Canal feeder in Trenton on Sunday at 10am, Nov. 20. The walk will explore the part of the canal feeder between Cadwalader Park and the junction with the main canal at Old Rose Street. More info at the DR Canal Watch website. There's a hidden valley in Princeton that everyone drives by but no one sees. Just over this ridge is Washington Rd, with athletic fields beyond. Down to the left is Faculty Road and Carnegie Lake. 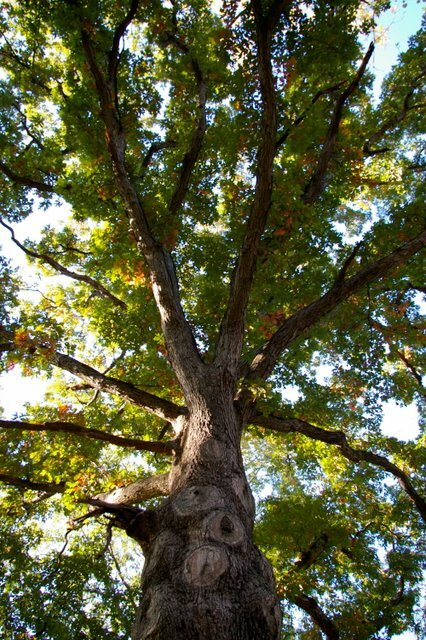 Despite being sandwiched between a busy road and Jadwin Gym, the valley's rich soil sustains old oaks, tupelo, beech and ash that reach improbable heights. This year, big changes have come to this long-hidden valley. Approached from Faculty Road, stacks of boulders and heavy equipment suggest some sort of road construction. A pile of stumps looks less than auspicious. Further up the valley, more boulders, bales of hay, and orange fencing. Giant trees, some a yard thick, have been cut down. How could this be anything but bad news? But wait, this post is getting depressing, so let's start from the top of the valley and work our way down. The valley, which is to say the remnant of valley that was never developed as campus, begins at the new bridge over Washington Road. In the distance is the new chemistry building and the football stadium. Looking downhill from the bridge, a lovely little stream meanders peacefully down the valley. Starting farther up towards Nassau Street, the stream runs underground through campus, then emerges (or "daylights") from a big pipe just below the bridge. The water immediately encounters what looks like an olympic luge track, attractively armored with stones. Further down, the narrow channel flows through a broad floodplain. All of this--the pleasing meanders, the floodplain for stormwater to spread out into, the series of riffles and little waterfalls over stones--is manmade. Why would anyone want to remake a stream? After a hundred or two years of flash floods caused by all the impervious surface on campus, the stream channel had eroded the ground around it, and was threatening to undercut Washington Road (beyond the green fence on the right) if nothing was done. Here's a portion of the old streambed, broad and ill-defined. More photos of the old streambed can be found in a post one year ago when members of the Princeton Environmental Commission were given a tour of the proposed project. A group from Rutgers developed the plans. In this photo, you can see the hoses used for pumping water around the section of stream being worked on. The "V" of stones at the left is called a "cross-vein". Water flowing over the rocks converges to scour out a pool just below them. Pools, riffles, and a narrow stream bed to focus flow are all characteristics of a healthy stream. The stacks of boulders, then, are materials used to direct water in such a way that the streambank will survive the flash flooding coming from the hardened landscape of campus. Lots of digging is required to form an adequate floodplain to accommodate the massive infusions of water during storms. The disturbed areas will be restocked with native plants, and though they had to take down some large trees, many were spared. So that gets us back to the downed trees. This section of white ash is 36 inches in diameter. I counted roughly 200 annual rings, which are caused by the alternation of light-colored fast spring growth followed by a darker band of slower growth later in the season. The tree, and others in the valley, standing or cut, could well date back to the Revolutionary War. Visitors to Mount Vernon may remember the giant white ash trees in the circular drive approaching the house. About 160 years back, this ash began to grow very slowly, as can be seen from the very narrow rings on the left. Perhaps it was shaded heavily by another tree, which apparently fell 120 years ago when the rings began to spread out again. It is unsettling that such old trees have been cut down, and all the more remarkable that few even know about it in a town that loves and protects its trees. But there are extenuating circumstances, tradeoffs made, factors that mitigate, at least partially, the loss. Erosion from campus has been undermining some of the majestic trees, and this project is meant to reduce that erosion. Time will tell if the trees that were saved will survive all the disturbance around them. Tree roots are very sensitive. And the carefully designed channel is not necessarily immune from the powerful erosive forces of repeated floods. One useful pursuit at this point would be to study the rings of the fallen trees to see what they might tell us of Princeton's past. I had recommended a pre-construction rescue of rare native plants like horsebalm, but the idea probably got lost in the mix. Not everyone has learned to make a distinction between rare wildflowers that have survived for centuries in a valley, and whatever natives one can buy in pots at a nursery. I had also encouraged them to remove the Norway Maples (mottled green/yellow in this photo and next) that have invaded the valley, since the invasive maples are competing with the old growth natives, and their dense shade will threaten the newly planted natives over time. Overall, though, there's reason to believe this stream restoration--rare in New Jersey--will validate its good intentions. The project leader spoke excitedly last year during the tour about how he hopes students will find the valley an attractive place to visit, rather than merely serving as a traditional shortcut for athletes heading to practice. This long-sheltered space, with so many stories to tell of past centuries, is beginning a new chapter worth reading. Squirrels are such showoffs. They're already putting us to shame by harvesting all their food locally, living in zero carbon footprint homes, wearing homemade clothing and making their young walk to school. Now they seem to be considering using bikes for transportation. There's an essay by a well-known author read long ago--I think of Late Night Thoughts On Listening To Mahler's Ninth, but the author's name, Lewis Thomas, doesn't sound right--that suggests squirrels are the likely successors to humans on earth. Perhaps they're checking out our hardware, assessing our strengths and weaknesses, biding their time. Note, 2/18/12: I finally came across the essay: "The Fire Apes," by Loren Eisley, from 1949. A hican behind Clark House, showing the change in bark where a pecan/hickory hybrid was grafted to a hickory base. And in memorium, a photo sent to me by Eric Tazelaar, of the old, old white oak near the driveway to Mountain Lakes House, before it was blown down this year during Hurricane Irene (see Oct. 28 post). We had to take down a pin oak recently, and tried to make the best of it. Primarily, the tree had squashed a key drainage pipe running beneath it, causing runoff to flow into our neighbor's yard. No other routes for the drainage proved feasible. Despite that reason, which was enough to get a removal permit from the borough, there was hesitation. The tree helps shade the driveway and house in the summer, and oaks provide food for an extraordinary diversity of insects, including the inchworms that fuel the migration of warblers north in the spring. But the oak, too, was each year casting more shade on the neighbor's vegetable garden and our own. In our yard as in others, a steadfast love of trees is increasingly having to share space with an interest in the local food movement, and the allure of solar energy as prices continue to fall. All three compete for the allegiance of arbiters of sunshine, whether it be a homeowner or the local shade tree commission. After many months of hemming and hawing, and recurrent floods in the driveway, we finally had it taken down. What, then, is the legacy of this fine tree, done in not by wind, or the bacterial leaf scorch that is taking so many red and pin oaks, but for having grown in the wrong place? Respect can be paid by making the most of its 40 years worth of bottled sunshine. The carbon it captured from the air and injected underground via its roots will remain there for many years, slowly shifting from wood to humus, a small but measurable service to slowing climate change. The straight trunk looked to hold some fine lumber, but arborists told us the wood is not as commercially useful as red oak. We ended up with firewood, which is conveniently packaged sunshine to drive a wood stove's metabolism in much the same way a pecan is nicely packaged to feed our own. Chippers these days can gobble up very large branches, even trunks of smaller trees, so I had to lobby to save for firewood some of the branches that are now routinely chipped up. They left the chips for mulch, the stored solar energy of which quickly became a snack for microorganisms ready to assist the wood's return to soil (see related post). As the tree's legacy lives on, the sunny void is quickly getting populated by dreams of varying degrees of practicality--of fruit trees, blueberries, and an arbor for grapes and squash to shade the driveway. And a young red oak, better placed, looks poised to claim its share of the sky's riches. A pile of fresh woodchips doesn't look particularly dynamic, but this one took only two days to start steaming. The steam, which rose from only one spot, gave the pile the look of a miniature volcano. Though steam may look like smoke, it's a sign of health, not danger--the steam being an ongoing exhalation and venting of heat as microorganisms consume the wood's energy, transforming it into heat, CO2 and water vapor. After a week or two, on a 55 degree day, the temperature about a foot beneath the surface was 140 degrees. It felt burning to the touch, but I've never heard of a small pile like this catching fire. I searched the web for testimonials, without success. "Georgia Gardener" website offered some validation for my lack of worry. It considers the danger of small backyard woodchip piles catching fire to be an urban legend. Much larger piles that are unable to vent their heat may be a different matter. Some people try to use this heat. There's an urban greenhouse in Milwaukee that heats its greenhouses in part with compost. If a lot of good organic nutrients end up in the wrong place, like these leaves and garden clippings incongruously banished to asphalt, or kitchen scraps thrown in the trash, it may be because any massing of organic matter is considered suspect. Fears that leaf piles cause odors, or kitchen scraps composting in the backyard attract varmints, often thrive without any need of evidence. Part of getting back in sync with the natural world involves allowing decomposition a place in the yard, working with its quiet powers, and thereby mending the circle that is nature's endless cycling of nutrients.